1. 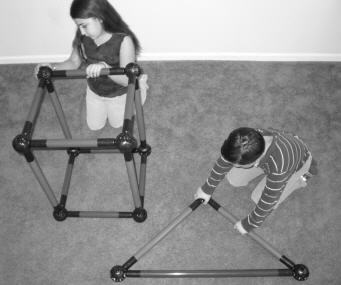 Teachers should build a 2-D triangle and a cube from Toobeez tubes (as pictured). 5. Have students record their conclusions and observations from this discussion in their notebooks. 6. Teachers should inform students that different types of polygons and polyhedra have different names. 7. Students should brainstorm in preparation for the activity to identify what qualities would best serve in classifying these two types of geometric figures. Challenge: Students should be able to identify and name various polygons and polyhedra. Teacher Note: To eliminate any confusion, review other classification parameters suggested by students and have the class discuss them. 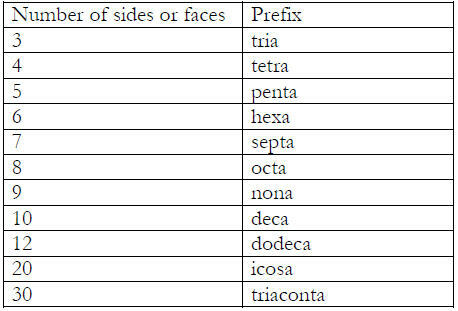 Teacher Note: Point out the Greek origin of these prefixes. 5. After allowing students to review the chart in Step 4, point out that the number of sides in a polygon and the number of faces in a polyhedron the appropriate prefix is used in naming the figure. 6. Next, guide the students in the general rules for naming polygons and polyhedra. Teacher Note: Be sure to point out some exceptions to this rule such as triangle and cube. 7. Using Toobeez, have each team build any random polygons, name them and record any additional observations about their polygons. 8. Have each group present their results to the class. Using their models, groups should explain their reasoning for naming the polygon. 9. Have the students break into their groups again and build various random polyhedra with Toobeez. Groups should then name the models and record any additional observations. 10. Have each group present their results to the class. Using their models, groups should explain their reasoning for naming the polyhedron. 12. Finally, move to the “Activity Discussion and Processing” section of the activity. What is the difference between the standard rules for naming polygons and polyhedra? Why is a foreign language used as the basis for naming polygons and polyhedra? Why is it important to have a systematic method for naming various geometrical figures? How are polygons and polyhedra useful in real world scenarios? What important aspect of communication does the naming system for polygons and polyhedra demonstrate? 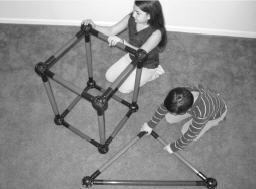 Have students measure the various dimensions of their Toobeez polygons and polyhedra. Have them calculate the area of the polygons and the volume for the polyhedra. Provide them with a listing of the appropriate equations. Ask them to explore why it is impossible to provide a volume for polygons. Also have them calculate the area of each face of a polygon (a cube is the easiest) and then calculate the sum of these areas. Explore why this sum is not equivalent to the calculated volume. For homework, assign students various polygons to draw on graph paper. Instruct them to measure and record both side length and degrees of angles. Have them record any observations from their results. Teacher Note: Require students to draw four examples of each type of polygon assigned so that any mathematical qualities can be observed.